The famous calligrapher William Caxton from Westminster had defined 2 font families in late 1400’s for old English and Latin Language. 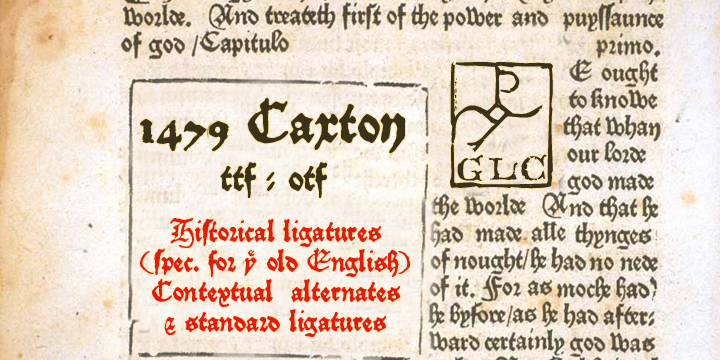 These 2 font families built the inspiration for 1479 Caxton Family. Published by GLC, this one normal style font contains most of the Old English and Latin Abbreviations and Ligatures, those missing were added to perfection by the publishing team. Though the original cap height is about 5-7 millimeters, it very well complements Lombardes, 1512 Initials, 1550 Arabesques, 1565 Venetian, and 1584 Rinceau from the GLC.